Like this little gemstone, Miss Lavender Jade assists in cherishing one’s ideals and desires. Her work promotes creativity, the visualising of dreams, encourages self-confidence and invites a sense of luxury. Miss Lavender Jade grew up in Hong Kong, a city where diversity and culture exposed her to many different powerful and well-groomed women as well as skin tones, bone structures and desires. Her interest in make-up really developed when she started hosting makeover parties at secondary school and noticed how her work was transforming her girlfriends into more beautiful & confident young women. She went on to study a degree in fashion & styling in London which exposed her to working backstage at London Fashion Week, assisting the styling teams, learning from some of the most talented make-up artists. Miss Lavender Jade’s passion for make-up grew when she took on a part-time job at Space NK whilst continuing her studies. 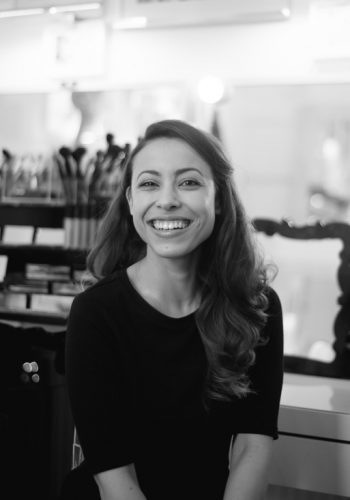 After 5 years of working with Space NK, she received training from prestigious make-up brands such as Nars, Laura Mercier, HD Brows & Kevin Aucoin picking up many trade secrets along the way. This really ignited her passion for make-up and she went on to formalise her skills training with celebrity make-up artist Mai Lee from the Mai Lee Beauty Academy where she enhanced her ability as a professional bridal, fashion & editorial makeup artist. Since joining the Pro Team Mel has strengthened her hair styling skills training and working alongside Gemma Sutton. Concealer! I have hereditary dark circles under my eyes and I find that a little of my favourite concealer by Chantecaille keeps me looking alive! If dark circles aren't a problem, I would say blusher is a must for everyone!